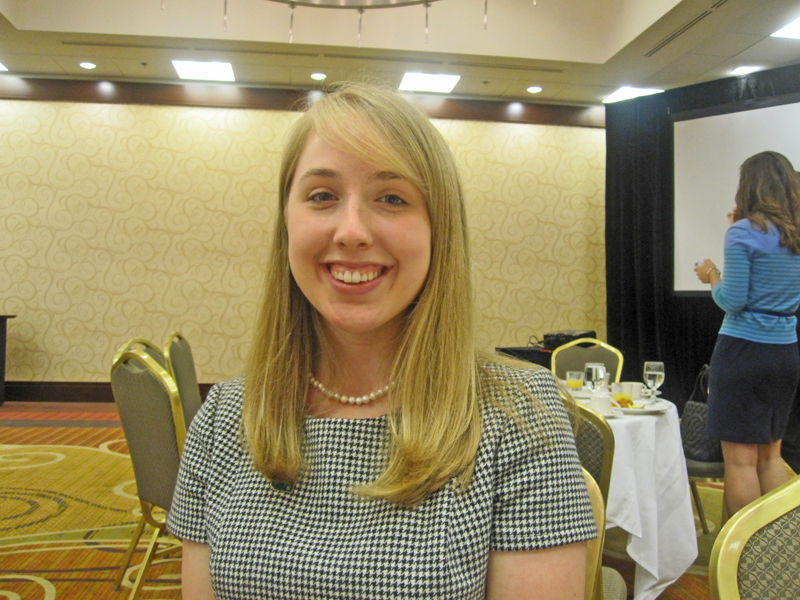 April Sanders, one of the organizers of Action for Washington, at the group’s first fund-raising breakfast in Bellevue Wednesday. OLYMPIA, July 12.—Meet April Sanders. At age 21, she has her whole life ahead of her. She could climb Mt. Everest, discover a cure for cancer. And she says she already knows how she’ll be spending the next couple of decades. She calls it her 20-year plan. First she’ll run for city council, then state Legislature. Then Thurston County auditor. And finally secretary of state. The one in this Washington, she means — not the one in D.C.
Sanders laughs as she says it. Yet it tells you something. There aren’t many 21-year-olds that even know Washington has a secretary of state, much less the career path the last two officeholders have taken. Sanders, a University of Washington graduate student at the Evans School of Public Affairs, is one of the student organizers in Action for Washington, a newly revived youth organization that has its roots in the glory days of the state’s moderate Republican tradition. Five years after its revival by the Mainstream Republicans of Washington, the group has 150 graduates who have passed through its weekly seminars while the Legislature is in session in Olympia. It is unusual enough to see a youth political organization with moderation as its rallying cry – indeed, Action for Washington claims a membership from both sides of the aisle. But when one considers the organization’s history, a major force in the elections of 1968, its story becomes particularly noteworthy. On stage at a Bellevue fund-raising breakfast this week were its founders, Reed and former King County Prosecutor Chris Bayley, along with two octogenarians who owe it plenty, former Gov. 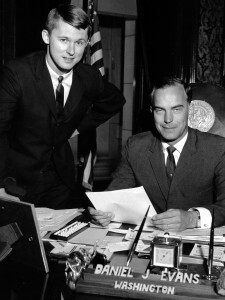 Dan Evans and former U.S. Sen. Slade Gorton. The organization was one of the important factors in building the centrist tradition that dominated the Republican Party in this state during the ’60s and ’70s. Time to pass the torch, Reed says. Back in the day: Sam Reed and Gov. Dan Evans. Reed, who retired last year after 12 years as secretary of state, was young once himself. There are photos to prove it. And in the late ’60s, Reed and Bayley organized a political movement that probably seems a little incongruous with the popular perception of the period. Rather than taking to the barricades and throwing Molotov cocktails, they figured the best way to achieve progressive change was to work within the halls of government. Reed chaired Students for Evans in 1964 as a Washington State University undergrad. Bayley had just returned to the state after earning his law degree at Harvard. Together they built an organization that provided 2,500 ground troops for the 1968 campaign cycle. The college students and the young were an important force in the moderate-Republican surge in this state that year. Evans won re-election, as did former Secretary of State Lud Kramer. Gorton, then a state representative, squeaked through in his first race for attorney general. Reed recruited Pasco City Councilman Art Fletcher to run for lieutenant governor, who lost to Democrat John Cherberg. Many of those involved in the ’68 campaign remain active in politics at the state and local level. Action for Washington continued in a sense after that race; its alumni founded the Cascade Conference, an annual GOP leadership gathering that now is hosted by the Mainstream Republicans of Washington. Of course the youth element faded over time, Reed explains, for a rather natural reason: People got older. The story became the stuff of legend. Chris Bayley and Sam Reed, founders of Action for Washington, explain group’s history. Five years ago the Mainstream Republicans launched a revival – not a grass-roots campaign organization as in the first incarnation, but rather as a leadership training effort aimed at the young. The group hosts weekly seminars in Olympia, with annual graduating classes of 30 or so – mainly legislative aides, interns, college students, typically ages 18 through 25. The time is right again for a movement of a centrist stripe, Reed says, moderate on social and environmental issues while favoring fiscal conservatism and local control. “This works for young people, because the gay rights issues, the environment issues, the distortions we saw last summer – they turn young people off of the Republican Party. 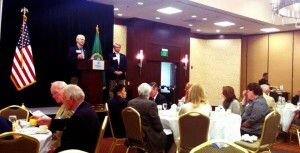 Onstage at the Bellevue breakfast one might have sensed a bit of that generational shift. After Gorton and Evans came Reed and Bayley. Then Wyman, the only Republican to win a statewide race in the Pacific coastal states last year. And then Caleb Heimlich, a 2010 graduate of the program, now executive director of the state Republican Party. 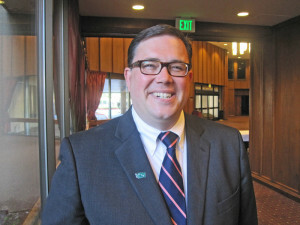 Alex Hays, executive director of the Mainstream Republicans of Washington.